Take off in one week! Whew, lots to update you all with, but I will keep it brief. I ran my final long training run before my trip on Sunday. 40 miles in a little under 8 hours. I even took some video that I will post shortly. Between my Camelback and a small fanny pack, I think I am set to carry enough supplies. I stopped by the local running store and bought a case of sports beans and a new bottle of electrolyte tablets. That mix seemed to cover me pretty well along the 40 mile run so I'm hoping it will work on the Great Wall. Interestingly, while the heat on my 40 mile run caused me some grief I think the benefit was that it forced me to slow down enough that I had almost no muscle soreness the next day. I did have a few blisters so I picked up some new socks too. I was tempted to get some new shoes, but I think it is probably too late to experiment with a new shoe even if I had some blister issues with my current pair of Brooks Adrenaline. If you are interested in the route I will be taking on my Great Wall Run, a FAQ of part of the route can be found at the Great Wall Forum here. Right now my plan is to get a hotel at or near Simatai and run to Jinshanlin and possibly on to Gubeikou (these are gates along the Wall with tourist access). My understanding is that there is a trail along the wall that is often used that I can follow. I'm still messing around with the Google map that I found of the Wall so I don't know exact distances yet. The FAQ states that one can walk from Simatai to Jinshanlin in 3 to 4 hours. I estimate that I can probably run that easily in 2 hours--so that will make a good stop to refill on water. Luckily, I still remember how to ask for bottled water in Chinese :). Apparently, it is possible to walk from Simatai to Gubeikou in one day so I'm guessing that I can probably run from Simatai to Gubeikou and back while using Jinshanlin as a "aid station." I'll use my GPS to track when I reach 25 miles out and just turn around at that point--either before or after Gubeikou, as necessary. Forum posts indicate that I will have cell phone access the entire way and I have already gotten a hold of an international cell phone with a Chinese phone number. I'll have a camera and a small video camera with me to document the event. I would like to thank all of those who have already donated! Thank you Mom, Dad, Sandra, Andre, Cruz, Jason, Greg, Gail, Scott, Kelly, Karen, Aunt Edith, and Uncle Wilson! If I have time, I think I will borrow Tim's and Deb's idea of writing everyone's names down to carry with me on the run. I have a suspicion that the solitude of this run might make the whole thing especially intense. On a final note, I placed the order for the t-shirts yesterday and they should be ready and in the mail to everyone before I leave a week from today. 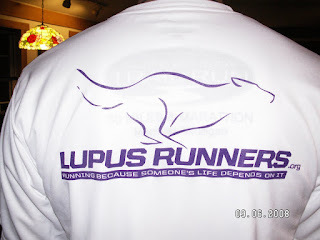 I'm going to order a new set of lupus runner shirts. If you would like one send me an email (brianjasenthomas@gmail.com) ASAP with your address and the shirt size that you would like. If you're helping us raise money I'll send you one for free--otherwise they are $10 each (this is simply the cost of the shirt and I don't make any money). My goal was to get two 50 mile runs and one 45 mile run before running Burning River. That would mean one 40 miler yesterday, a 45 miler just before I leave for China, my much anticipated 50 mile Great Wall run, and a final 50 miler in July before tapering. I set out at 5 AM yesterday with the goal of getting a solid 40 miles in before lunch and also testing the running gear that I am planning on taking to China. Unfortunately, some foot pain around mile 30 caused me to slow down significantly so I decided to call it quits 33 miles in at a time of just over 6 hours. I'm not sure what the foot thing is--it doesn't feel severe, but I don't want to create a more severe problem by pushing myself too hard. I still have some time so I'm not worried. Yet. The logistics of my China run are interesting for a few reasons. First, I will be traveling pretty light so won't have room for much running gear. Second, since it will be a solo run in relatively unknown terrain I will need to carry more food and water than usual. Third, since I am not checking any of my luggage I can't carry many liquids and, I have heard, even transporting energy Gels is sometimes problematic. So, I went out yesterday with my Camelback Lobo back with 70 ounces of water and 4 packs of Sport beans and 5 packs of Sharkies. Over 33 miles, I drank nearly all the water, ate all the sport beans, and 3 Sharkie packs. I also stopped and ate a breakfast sausage sandwich at a gas station (that's sort of like baozi, right?) The water + solid energy food + sausage sandwich seemed to keep my energy up okay so I feel good about my equipment/nutrient choices. I should have enough room in my pack for 15 bags of sport beans (I've decided I prefer these to Sharkies) or 1,500 calories. Theoretically, if I consume 200 calories per hour that will carry me about 7 hours. Given Great Wall Marathon finishing times, I will really need to plan for up to 12 hours on the move. Consequently, I will need to plan on getting another 1,000 or so calories along the way. My hope is that a lunch of noodles and a few cokes should be enough to make up the difference. Ideally, I'll also be able to get a hold of some Gatorade, but I will have to wait until I am there to see. I've heard that I won't be able to expect much between tourist stops, but I believe these are about 20 km apart on the section I plan to run so I don't think getting a little something else to eat will be too problematic. There are still some details to work out, but I'm getting there!